Laoding a shell into the breech of a 9.2-inch Howitzer. 65th Regiment C.A.C. Photo of a gun emplacement. Note the sandbags surrounding the gun pit. In the foreground are 9.2-inch shells with fuses in place. 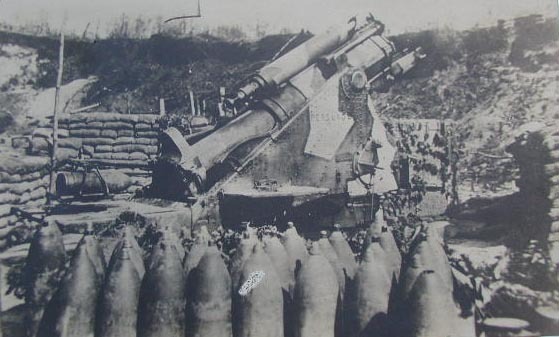 At the breech of this gun is a shell ready to be loaded. Overflow of British orders to American plants for the British 8-inch and 9.2-inch howitzer designs had developed ready capacity in this country for the production of field weapons of the large size which the Ordnance Department at once took advantage of upon our entrance into the war. This 8-inch Howitzer had been designed by the British in the early days of the war and had proved its fighting qualities on the battlefield. 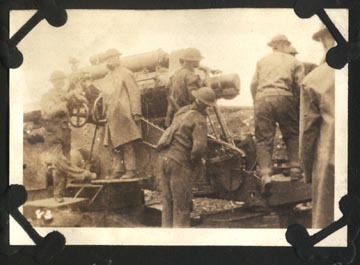 Just eight days after our declaration of war with Germany, April 14th, 1917, we ordered 80 of these eight-inch howitzers from the Midvale Steel and Ordnance Co., at Nicetown, Pa., the concern that was a manufacturing them up under British contracts at the time. It was understood that production on our order would begin upon completion of the British order. Production proceeded so favorably that the first completed unit was proof fired on December 13th, 1917, with excellent results, and by May 1918 production had increased to six per week. Under a subsequent contract the total order for this unit was increased to 195, of which 146 were completed and accepted to November 14, 1918, of which 96 were shipped overseas. To keep up with the stride of Artillery Development during the war, it was found advisable to design and eight-inch Howitzer with longer range than the first unit produced by the Midvale Company. When this design was brought out it proved a range of nearly 13,000 yards, or about 2,000 yards greater than that of the first 8-inch design. The second design was known as the Mark VIII 1/2 and the first as the Mark VI. An order for 100 of the new type was placed with the Midvale Company on October 2nd, 1918, carrying specifications also for a new and heavier type of carriage. The Bethlehem Steel Company was working on a contract with the British government for the British 9.2-inch Howitzer when we entered the war. The company expected to complete the orders by July 1917. Here also was established capacity for early heavy gun production and the Ordnance Department took advantage of it by placing an order with the Bethlehem Steel Company for 100 of the 9.2-inch howitzers calling for British specifications throughout. 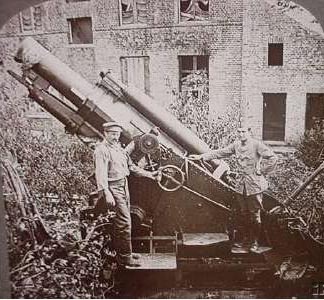 At the same time we placed orders for 132 of these units in England, British production of medium and heavy guns having become so well-established at the time that it was possible for them to undertake to contribute to the equipment our first divisions. The Bethlehem Steel Company was unable to reach production on our order but the British concerns delivered 40 Howitzers before the Armistice was signed. But in the general scheme laid out for equipping our divisions with heavy Howitzers, orders for both the 8-inch and the 9.2-inch design were place merely because established facilities insured early deliveries. The British 9.2-inch Howitzer fired a 290 lb. shell at a range of about 6 miles. Side view of the British 9.2-inch Howitzer. This weapon was transported to the gun emplacement by rail car and then off loaded and was semi-fixed in its position. To be moved again it would have to be dissambled and reloaded onto a rail car for transportation.